100% Cloud Based Secure Networking. WhatsUp Gold 2019 has Arrived! WhatsUp Gold is a comprehensive Network Monitoring Tool designed to be a ‘One-Stop Shop’ for visibility into your Network. Proactive alerts allow you to have notification of issues before your Users start to complain. Clear and Consise maps in WhatsUp Gold 2019 gives you instant access to your monitored devices to delve deeper and assist troubleshooting issues. High Level visibility of issues from the Overview screen introduced in WUG 2018 is perfect to determine issues at a glance. Building on the success of WhatsUp Gold 2018, Ipswitch have added to and enhanced the capabilities of WUG in their latest version. Receive Alerts before your users inform you of issues! 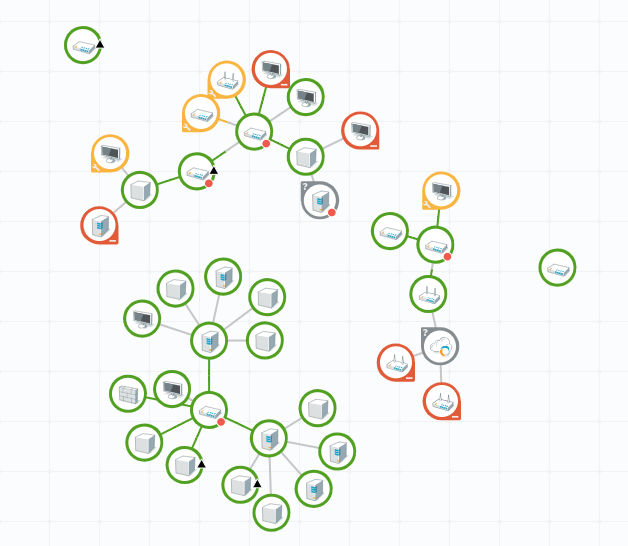 Automatically discover and map the whole of your Network. Gain visibilty of the connectivity and dependancies on your devices. WhatsUp Gold is so customisable, but with the vast number of out of the box alerts, you can get alerted before your users tell you about the issues. Active Monitors will let you know devices are up or down. Performance Monitors will go deeper and give you utlisation statistics, which you can be alerted on. Create customised dashboards to display, giving you a "quick glance" overview on the state of your Network. Mix and match the reports on the dashboards to make it relevant to departments / users or type of equipment being monitored. •	Gain enhanced visibility of your bandwidth usage. •	Discover what traffic is flowing across your network and between which devices, applications and users. •	NTA can help troubleshoot bandwidth issues by helping you identify bottlenecks, bandwidth usage or a suspect protocol. •	Monitor the performance and availability of your Applications with ease. •	Confirm if Applications are meeting their SLA's . •	Analyse application performance problems over time or diagnose chronic problems with the Component Summary Dashboard. •	Build dynamic maps of your VMware and Hyper-V environment. •	Historical and real-time visibility of your Virtual environment. •	Monitor the performance and resource consumption of hosts and guests, including CPU, Memory, Disk and Interface Utilization. •	Automate your configuration changes and backups of network devices. •	Archive to & Restore from an encrypted repository. •	Audit device configurations using predefined policies. •	Compare before and after configuration changes. If you would like to download an Evaluation copy of WhatsUp Gold, please click on the button below.